Lumma design usually picks the biggest most badass versions of cars to tune, but this time they’ve gone all sensible and tried out a diesel-power BMW X6. The looks is still pretty much Lumma though, with a body kit including front spoiler bumper with rather enlarged air inlets. Head light “eye brows” and mirror hatches, the rear spoiler lip are, as well as the sportive look engine bonnet, made in carbon. Besides, the beefy car body extension all around and the side skirts with brake cooler optics have extremely modified rear apron with diffuser demanding attention. Down tuned tail lamps is another attraction. The sportive look is accomplished by the matt black front kidney grille frame and the stripe design. The choice of wheels fro this car is LUMMA Racing CLR 22 in 10” and 12×22” with tires in 295/30-22 in front and 335/25-22 rear. 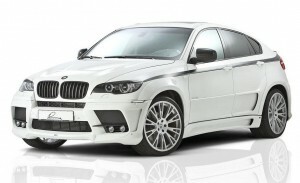 As for the engine, the standard X6 xDrive40d engine comes with 225 kW / 306 hp / 600 Nm. The LUMMA Design d-box „generates“ 250 kW / 340 hp / 670 Nm. A power module for the gas pedal provides for the better and faster gas reaction and, thus, for the optimal acceleration. The also proprietary sport exhaust system in X6 M look with 4×100 mm tail pipes in black racing optics with LUMMA logo is quite powerful voiced. The good thing is no one will ever realize this is a diesel car!